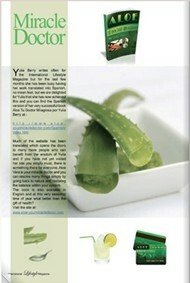 After reading your book 'Aloe - Your Miracle Doctor' I was amazed at the many different uses for Aloe. In the past, I always knew about the healing powers of Aloe for burns, but was ignorant of its many other abilities to cure. Recently, while cooking, I badly burned my wrist and was using an antibiotic ointment on it, but it was not healing. In fact, it was getting worse. I started using Aloe on it and it immediately started to feel better. In one week it was completely healed. Now, I keep your book close at hand so that I can readily avail myself of the numerous other uses for Aloe. Thank you for writing such an informative and interesting book. I had never given much thought to the plant, itself, except as noting it as an ingredient on the labels of various commercial products that I have used. It is surprising to read of the many beneficial uses the leaves have when prepared in the proper way and either applied externally or taken internally in either liquid or solid form. I plan to experiment a little with a few of your home remedy recipes. An interesting read. It sounds totally amazing--I am going out to the Natural Food Store right now to see what kind of aloe products they have, as well as getting a plant. Good luck in your ventures---you seem to be very dedicated and thorough in your research. substances. With so many truly bad side effects to today's medications, it's nice to be able to cure oneself using what you probably already have in your fridge or cupboards. I decided to use topical aloe to diminish my scar. The results have been amazing! Let's just say that I'll be bikini-ready for next summer. in abundance in the frigid Northeastern winters. 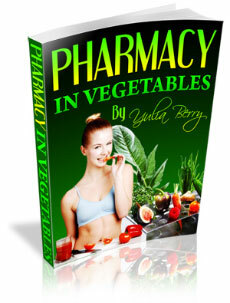 "Pharmacy in Vegetables" and look forward to trying these recipes, as well as saving tons of money at the drugstore. essentials to start using natural cures right away. needed ingredients. Thanks so much for helping me and my budget. The book is great, lots of information, so much useful stuff. I think that everyone should have this book, 'cos this plant can change human's life. I know from a personal experience. I just finished reading your book. It is very interesting and I greatly enjoyed it. I am going to try some of the remedies. I have an Aloe plant, now I will put it to use. I also printed out the pages. Thanks for all the wonderful information. I read the Aloe book and I think it's great. I read it in one sitting. You probably know aloe has been used for centuries to treat burns and scrapes. It’s probably safe to say, you’ve even used it for at least one of those two (that includes sunburns!). Are you aware that aloe is referred to by many researchers as “Nature’s Miracle” because of the dozens upon dozens of other ailments it can treat? Chances are you didn’t. That is because the huge drug companies don’t want you to know about that. They have kept it under wraps because they make money through research of disease treating drugs. It takes years and millions of dollars to find a drug, test it, and finally market it. That then funds their next project. It’s a horrible cycle that never ends. The drug companies don’t have the time (or simply don’t want to) to study the benefits of natural treatments, remedies, and cures. There is no money to be made from anything that can’t be patented. Unfortunately for all of us, they are a business and money is the bottom line. The reality is, today it costs $1 billion to develop a drug for market and without airtight patents to protect it, there is no way for drug companies to get a return on such a massive investment. Once they get a new drug on the market, the list of side-effects is longer than our commute to work and sometimes worse than what they are supposedly treating. Contrary to what the drug companies lead you to believe, there are all-natural remedies that are readily available. Aloe is on the top of that list. It has been proven to treat so many ailments that it is referred to as a miracle plant. There have been thousands of scientific studies performed on aloe's healing abilities and still the public has never heard of most of them. The media will never tell you about these scientific findings because the "big money" drug companies will stop them. The drug industry does not popularize aloe because drug companies can't patent an aloe plant (they wish they could!). Aloe has such an amazing chemical composition, proven scientifically, like no other plant. How much does it cost? About $3 - 5 per plant. Is Aloe vera really a miracle plant? Many facts and continued research are available, so you may decide for yourself. Organized medicine and pharmacology have not embraced Aloe, because it cannot be patented and its usage threatens literally hundreds of prescription and non-prescription drugs. Aloe vera is hypoallergenic and has no known side effects even in large doses." Hedendal, Bruce Eric (DC, PhD). (N.D.). Whole-leaf Aloe vera, almost a panacea: An overview of one of the most accepted, yet misunderstood, medicinal plans in history. Simply Natural Products. thousands of years. The American medical and pharmaceutical communities most likely have not accepted it because it can’t be patented nor a prescription written for it." Perhaps the most remarkable studies concern the effect of aloe fractions on the status of patients with HIV which causes AIDS. The polysaccharide fraction of aloe was shown to exhibit antiviral activity and enhance immune cell function. Danhof, Ivan E. (PhD, MD). Internal uses of Aloe vera. Aloe vera improves wound healing and inhibits inflammation. Davis, Robert H. (PhD), Di Donato, Joseph J. (BA, BS), Hartman, Glenn M. (BS), & Haas, Richard C. (BA). (1994, February). Anti-inflammatory and wound healing activity of a growth substance in Aloe vera. Journal of the American Podiatric Medical Association, 84(2), 77-81. Aloe inhibits the growth of some of the most dangerous microbes. Heggers, John P. (PhD), Pineless, Gary R. (BS), & Robson, Martin C. (MD). (1979, September/October). Dermaide Aloe / Aloe vera gel: Comparison of the antimicrobial effects. Journal of American Medical Technologists,41(5), 293-294. ...Aloe vera has an unlimited future in new applications, and I sense in dentistry we are just on the cutting edge of promising utilization for anti-inflammatory procedure, antiviral, and immunological benefits for our patients. Moore, Timothy E. (DDS/MS, PC). Aloe vera: Its potential use in wound healing and disease control in oral conditions. Aloe Vera will speed up the healing of a burn or some damaged eczematous skin just as well as it will heal a mouth ulcer or even a stomach ulcer or a problem of the bowel lining – all epithelial tissue. Atherton, Peter (Dr., MBChB, DObst, RCOG, MRCGP). (1997, June/July). Aloe vera: Myth or medicine? Positive Health. Issue 20. There are several aloe based products on the market right now. This is in response to the fact that the benefits of aloe are slowing slipping out to the public. The problem with most of these products is that they have been over-processed which renders the aloe nearly useless. Even the “100% Natural” aloe products contain up to 90% water! A loophole that is widely used throughout manufacturing. The key ingredient in aloe vera is mucopolysaccharides [MPS] (long-chain sugars) that have very strong antiseptic, anti inflammatory, anti-viral, anti tumor and immunomodulatory properties proven scientifically. The polysaccharides or long-chain carbohydrates in aloe have an amazing ability to pass through the stomach and digestive tract and move into the circulatory system without being digested by the enzyme systems in the human digestive tract. They are absorbed by a process called endocytosis and taken up into the cell intact. These mannose-containing molecules are then extruded into the circulatory system, where they are able to fulfill their immune-supporting functions. What this means: the immune supporting elements in aloe are not broken down by your body so they pass into your cells and circulatory system as they are in the plant. Aloe vera gel used externally helps with acne, sunburns, thermal and radiation burns, boils, dandruff, gum sores, dermatitis, edemas, hemorrhoids, inflammation in the eyes, insect bites and stings, psoriasis, skin rashes and irritations, ulcers, varicose veins, warts, wounds and wrinkles. When you apply freshly squeezed aloe vera gel on the affected area of the skin, it creates a protective coating which speeds up the healing process, decreases swelling and redness, reduces inflammation, relieves pain, promotes synthesis of collagen in tissue and prevents blisters in case of burns. Taken internally, it reduces inflammation which is involved in such diseases as ulcerative colitis, arthritis, and gastritis, helps with the reduction of blood sugar with both type I and II diabetes and has a powerful healing effect on AIDS, cancer, tumors and many different immune system disorders. Mucopolysaccharides found in aloe vera are very effective intracellular antioxidants which is very important in preventing and treating arteriosclerosis, heart disorders and Parkinson's disease. Properly preparing aloe is the only way to maximize its potential. The Biogenic Stimulation Method was proven scientifically in 1930s and has already been successfully used by traditional and folk medicines in treating various diseases in the last 70 years. It has passed prolonged clinical tests and has been highly appraised in many countries. This method is very easy to do at home and it is used in home remedies as a very effective treatment of such serious diseases, like stomach cancer, mastopathy, radiation burns and serious skin disorders. Today home remedies have become more and more popular because people have become aware of the harmful side effects of synthetic drugs. Like many people around the world, I am allergic to a lot of medicine, in particular antibiotics, sulphonamide-based groups of drugs, penicillin, Novocaine, etc. And I get allergic reactions to most cosmetic products. That is why I always had to look for alternative cures. I have tried many home remedies and found that they really work and do not give any allergic reactions. I started collecting effective home remedies. I found that aloe has been used for generations in homemade medicine without questions on HOW it works simply because it does. 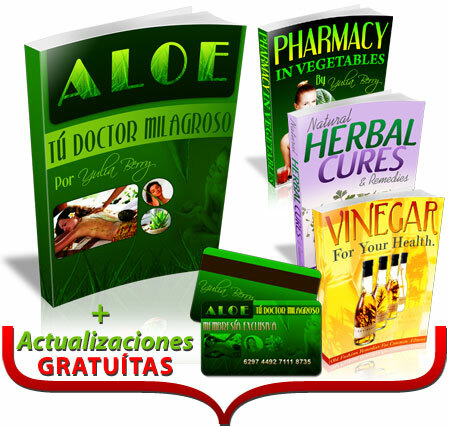 I have taken years to collect these long-used recipes, found other clinically studied formulas, and conducted many interviews to form one easy-to-read and follow eBook on Aloe. Everything from its history down to its modern day uses has been included. You will save hundreds of dollars since I have included home remedies made of aloe and natural ingredients available in any supermarket or health food store for just pennies. You will have to try these home remedies to get results. You have to follow a recipe and do not skip any day of a treatment. 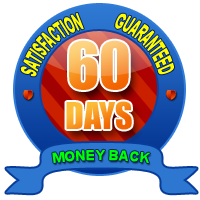 If you are trying a skin care remedy, remember that the renewal circle for skin cells is 28 days, that is why you will see the complete result as early as in 28 days. All remedies are very easy to make. 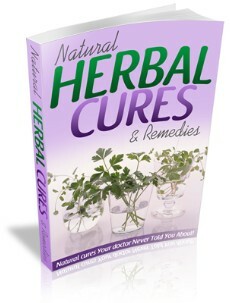 Index of herbs used in these home remedies with pictures and brief descriptions on their health benefits is also included. If you're serious about treating your health problems naturally or getting beautiful skin and hair without spending hundreds of dollars on expensive skin care and spa treatments ... get this report right now and read it today. If you need to justify the expense, skip going out for dinner once this week and it's paid for. Aloe is a truly miraculous plant that has been known for too long in the medical history to be ignored. This is one of the best benefits of ebooks. 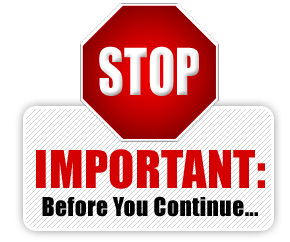 If a new edition of a hard copy book is released, you have to go to a bookstore or amazon.com and buy it all over again! Not so with ebooks. 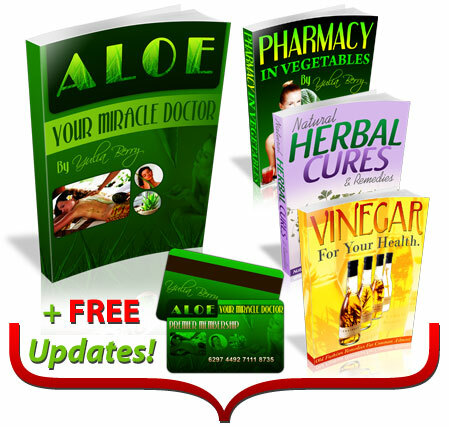 When a new, updated edition of Aloe - Your Miracle Doctor, is released, you get it for FREE! It's easy - I will simply contact you through my private clients-only email list and send you instant download instructions so you can stay totally up to date on the latest aloe vera research and new tested home and beauty remedies. 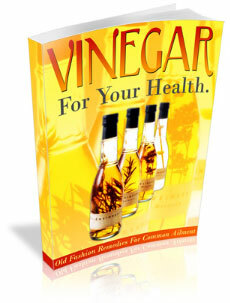 Cider vinegar is very effective in detoxifying various organs in the body together with the blood stream. Hence it is a purifier, as it has a means of breaking down fatty, mucous and phlegm deposits within the body. It therefore, promotes the health of the vital organs of the body e.g. 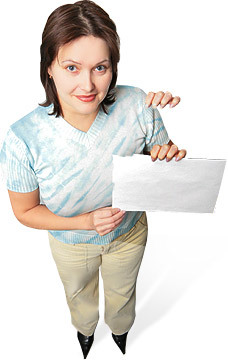 kidneys, bladder, liver etc., by preventing an excessively alkaline urine. The facts and research in this book benefits everyone - Whether you're a 21 year old student in University or you're retired at the healthy age of 65, you'll find the information within very useful. It focused on common illnesses and treatments used by Chinese, Europeans, Indians and Asian cultures dating back for centuries. 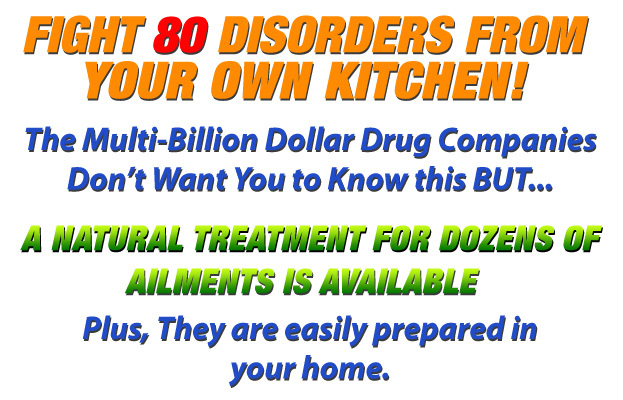 With the right combination of ingredients, a cure can be created in the privacy of your own home! Phytochemicals found in vegetables modulate hormone metabolism, stimulate the immune system, and have antioxidant, antibacterial, anti-carcinogen, antiviral and anti-inflammatory properties. In this unique report there are over 140 tested home and beauty remedies using just simple vegetables, acknowledged by the newest scientific research. 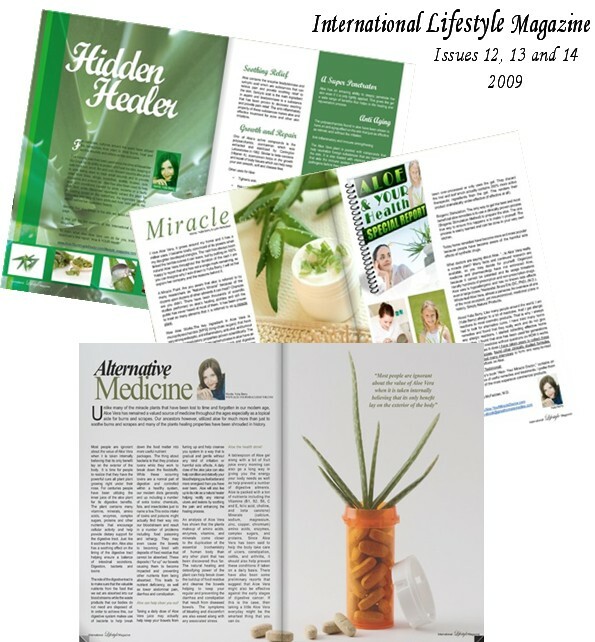 Right Now is your chance to try the amazing remedies with miraculous healing aloe. This is one of those moments when you have to take your fate in your own hands and start doing something...Isn't it time you tried something that actually works? You've found what you've been searching for. Now do it! Click below to order right now for only $ 47.00 (even if it’s 3:00 am in the morning). 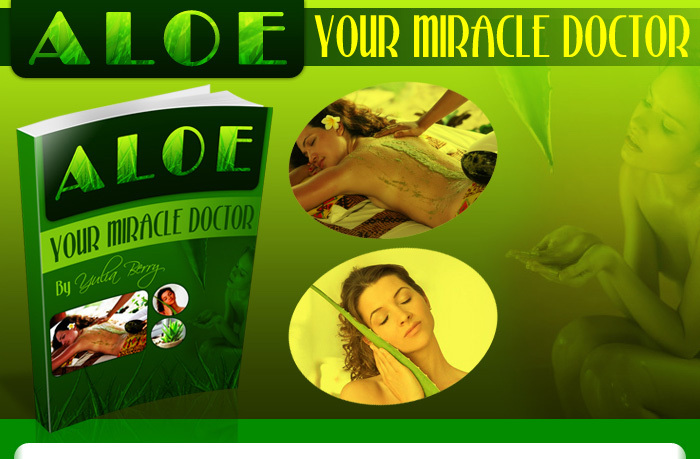 Don't you owe it to yourself to try 'Aloe - Your Miracle Doctor' TODAY? On the other hand, if Aloe - Your Miracle Doctor helps with your health problems, then I want you to e-mail me your testimonial to tell me about the results - and tell all your friends about it, too. If you have never ordered anything online, go to the order page and I will explain to you all the steps of your ordering process and why it is secure to use ClickBank in your transaction. Copyright © 2007-2016 www.Aloe-YourMiracleDoctor.com All Rights Reserved. 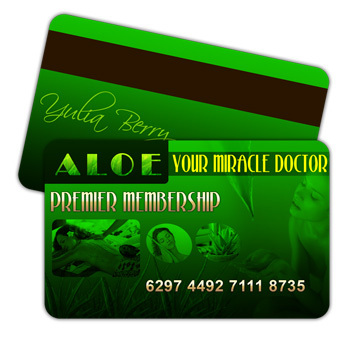 Yulia Berry's book "Aloe- Your Miracle Doctor," contains an abundance of useful remedies and treatments. I prefer them to many of the more expensive commercial products. 9 INDEX OF HERBS USED IN THESE HOME REMEDIES (INCLUDES PICTURES AND BRIEF DESCRIPTIONS OF THEIR HEALTH BENEFITS).